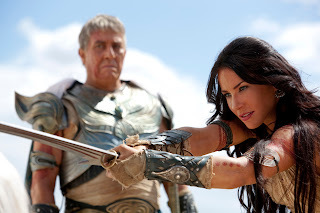 Home / Andrew Stanton / Columbia Pictures / Lynn Collins / movie / Walt Disney Studios / Lynn Collins, the Princess of Mars in "John Carter"
Lynn Collins, the Princess of Mars in "John Carter"
“Dejah Thoris is the Regent of Science and Letters, so she’s a very intelligent woman,” enthuses Collins. “She’s also the princess of Helium, which is one of the cities of Mars. You really don’t know exactly where they are history-wise on Mars in the film, but you do know that females are considered equals and that there are men and women fighting together. “I found it so wonderfully modern and so exciting to be part of,” she continues. “I think Dejah’s in touch with both sides of her persona, the feminine and the masculine, and that’s so powerful. And as an actor it is so rewarding to play somebody who is actually so well balanced in that masculine and feminine to where the part about being a princess in a classic sense really just kind of comes in ever so slightly. “The heart of the story is very much about saving my people and that’s about as big of an objective as you can get. When Dejah meets John Carter everything sort of shifts and yet the prime objective is still to save her people. She falls in love with him, and although that does not change her objective, it definitely changes her perspective. Collins also feels incredibly lucky to be working with Andrew Stanton, who has taken extra care to make her feel both empowered and comfortable with her character and with the physical aspects of her the role. “I just can’t talk enough about Andrew Stanton,” she says. “He is so incredible and has made me personally feel so safe to explore myself in this role and in this world. I’m not only feeling like I am expanding as an actor but I’m expanding as a human being as well. The whole process is such a discovery and a journey with Andrew and I just I feel so safe as an artist. 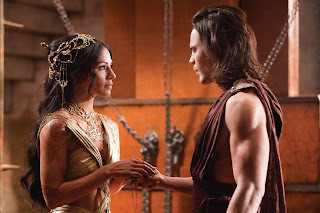 Working with co-star Taylor Kitsch, who plays John Carter, has also been a gratifying experience for her. “I’m really big into astrology,” she explains. “The way I’ve approached this is seeing his character like the planet Earth and my character like the planet Mars and the qualities that they embody are so different. Taylor and I are very different people, so I think that is really bringing so much to the project and to the chemistry that we have. We are just so different in real life that on screen you do believe she’s from Mars and he’s from Earth and you wonder how they are going to get together.